Search Results for "Abdominal ultrasound"
An unidentifiable ultrasound technician preforms a medical abdominal ultrasound procedure on an aging male Medicare patient to check for a descending aortic aneurysm. The doctor is showing the Mother her baby in the Abdominal Ultrasound Monitor one week before the birth in the clinic. 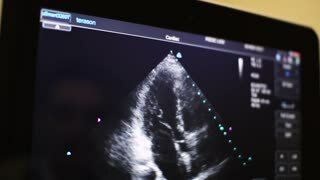 Close-up screen and ultrasound machine. Male doctor examining the woman's abdominal organs using an ultrasound scanner. A young doctor examining the woman's abdominal organs using an ultrasound scanner. Modern medical equipment in the clinic. Male doctor examining the woman's abdominal organs using an ultrasound scanner. New equipment with a screen in a modern clinic. Male doctor examining the woman's abdominal organs using an ultrasound scanner. The medic shows his hand on the screen of modern equipment and talks to the patient. Male doctor examining the woman's abdominal organs using an ultrasound scanner. Modern equipment. Medicine. Close-up of a doctor's hand examining the woman's abdominal organs using an ultrasound scanner. New equipment with a screen in a modern clinic. Ultrasound examination of abdominal cavity patient woman. Diagnosis of a person in the clinic. Professional Medical Equipment. Close-up of patient's stomach with gel in ultrasound diagnosis room. Modern equipment. Medicine.